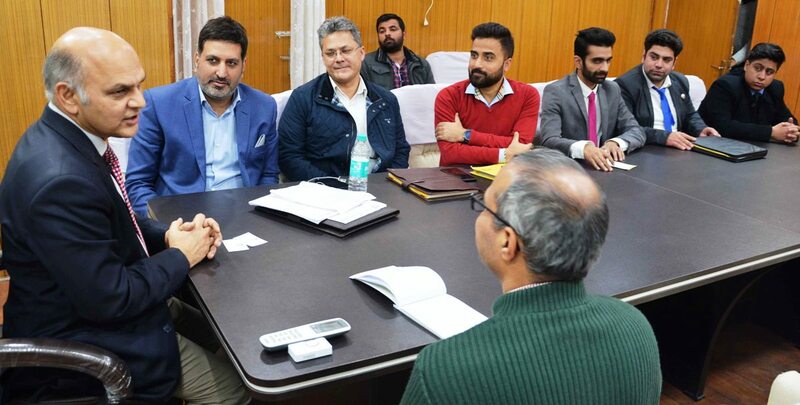 A delegation of Kashmir Chamber of Commerce and Industries (KCCI) on Thursday called on Advisor to Governor, Kewal Kumar Sharma here and submitted a memorandum of demands. Several other deputations and individuals including newly elected Panchayat Representatives (PR) and urban body members from different parts of the state also met the Advisor and brought their issues into his notice and sought early redressal. The delegation members of KCCI headed by its President, Sheikh Ashiq discussed their demands and sought revival of Carpet Manufacturing Industry in J&K, Horticulture Compensation Status, Crop Insurance, J&K Trade Centre for Promotion of Trade, Commerce and Industry, Budgetary Support for revival of Handicrafts Sector, reduction of GST on Handicrafts and shawls, North East Industrial Package and alike. The Advisor asked them to consider the suggestion of setting up of solar power plants in the industrial units in Kashmir. Meanwhile, Sarpanchs from Tehsil Majalta, Udhampur, and Ghagwal including Sarpanch Nakki, Sarpanch Thial, and Ghagwal besides President Municipal Council Kathua, Naresh Sharma also met the Advisor and apprised him about the issues related to PHE, PDD, PWD and other development requirements of their respective areas. The Sarpanchs demanded construction of roads from Chougan to Thial, Sunal to Shamsham Ghat Chigla Sunal, Chougan to Neeli of Panchayat Thial besides roads from Darkala Tared Bani Laid Middle School, Nakki to Primary School, Sorth, Lohara Mohalla to Sahib Bandgi Road,Main Road to Shamshan Ghat Nallah of Panchayat Nakki and road from Bainser to Khadian Traina Chora village Sundla. The Advisor asked the Sarpanchs to keep on working effectively for the development of their respective panchayats. A deputation of Daily Wagers of PHE from Doda also put forth their demand for regularization of services. The Advisor said that the genuine demands and grievances registered would be forwarded to the concerned departments for prompt action.